The Committee to Protect Journalists (CPJ) is organising workshops on ‘Safety Kit for journalists covering the elections’ in Guwahati, Imphal and Agartala press clubs. 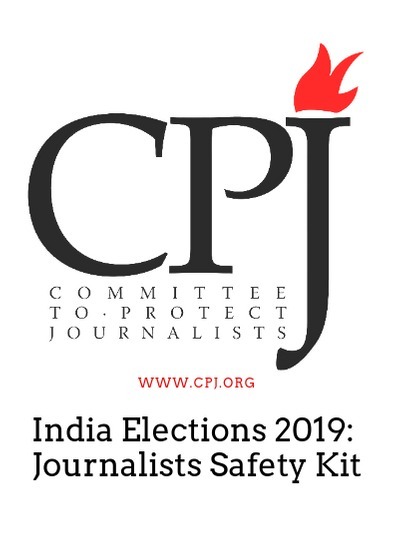 To be organized in Guwahati on March 27, in Imphal on March 29 and in Agartala on March 31, the workshops will include distribution of CPJ Election Safety kit. CPJ's Emergencies Response Team (ERT) has compiled a Safety Kit for journalists covering the elections. It contains information for editors, reporters, and photojournalists on how to prepare for the election, and how to mitigate digital, physical and psychological risk. A major section of the kit focuses on Digital Safety for journalists. India is scheduled to hold national and provincial elections from April 11 to May 19, 2019. As the country celebrates over 70 years of democracy, journalists are under pressure from attacks, harassment, cyber bullying, and government restrictions. At least five journalists were killed in relation to their work in India in 2018, including four who were murdered, according to CPJ research. Kunal Majumder, CPJ's India Correspondent will be present during these workshops. CPJ is made up of about 40 experts around the world, with headquarters in New York City. CPJ's work is based on its research, which provides a global snapshot of obstructions to a free press worldwide. CPJ's research staff document hundreds of attack on the press each year.